These days everyone needs something to keep the sun at bay and our outdoor umbrellas are the perfect solution to provide shade during the hotter parts of the day. The design of umbrellas has come a long way over the last few years. No longer do we need to struggle with the flimsy umbrella in the middle of our table, blocking our view and threatening to lift up in a single gust of wind. Eco Outdoor’s outdoor umbrellas are crafted using only the finest componentry to offer you the perfect balance of modern outdoor style and luxurious comfort. They’re built to withstand the harsh outdoor climate and are a stylish and practical choice for any garden, balcony, patio or courtyard. 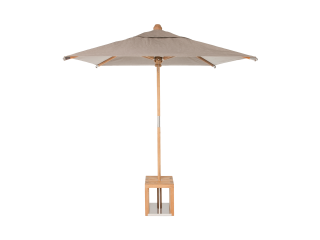 If you’re looking for outdoor furniture online and trying to find the right beach umbrella, come and talk to us at Eco Outdoor®, we’re the outdoor furniture specialists. When it comes to outdoor umbrellas one of the most important things to consider is the stand, how you'll anchor the umbrella to the deck. It needs to be strong and durable, but most importantly, it needs to look stylish and not detract from your umbrella or your outdoor setting.